The holidays are all about food and before the new year I give you one more treat – the Weckmann. 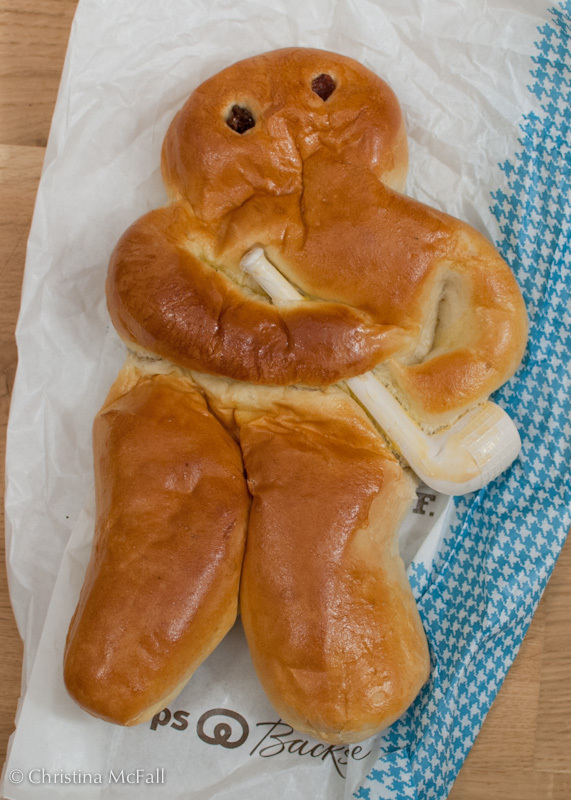 My Weckmann here is a little smushed, but you can still get the idea – he’s like a gingerbread man except made out of sweet breadroll dough, with raisins for eyes and a nice pipe. I don’t know much about them, but when I saw him at a local bakery I knew I had to buy one. From what I’ve read they go by many different names and are traditional treats on St. Martin’s Day (Nov 11th) and St. Nicolas’ Day (Dec. 6th), but I bought mine on Dec 15th, so I think they may be just seasonal too. You can find a Weckmann recipe here. And a google image search for Weckmann turns up a lot of fun images. Previous post: daily photo: central heating coat	 Next post: Frohes Neues! 2 Responses to "daily photo: weckmann"
Alternatively, he could be heading out for a nice game of golf or a small yodel on an Alpine hill.